The DODC-4 includes a powder coated metal base with a stainless steel Faceplate, hidden condenser Microphone, a 3” Speaker, and 3 Vandal Resistant Push Button Switches specifically designed for the Detention industry. With its pre-wired cord it is perfect for those locations where some user control is required. The Face is Laser Engraved to prevent wear and destruction of labeling. 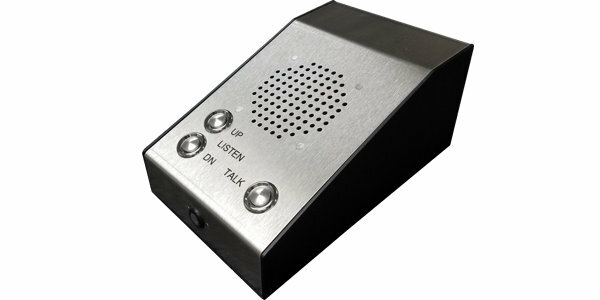 One button is a “Talk” (Push To Talk) and the other 2 buttons are “Listen” gain Up and Down to control the listening sensitivity. The microphone is mechanically shock resistant mounted on the front of the unit. An electronic balancing circuit shapes the omni- directional microphone for high voice band sensitivity while adapting it for low impedance connection over long wire lengths with minimal noise. Wiring is a standard twisted, shielded audio pair cable. The integral 3” loudspeaker is moisture resistant and includes vandal resistant metal barriers to protect it from abuse. The speaker has a 45 ohm Voice Coil for proper impedance matching to the ICA-202 Amplifier.